Love is the most powerful force we can possibly harness. Unlike food, clothes, and other material things, no one can steal or control the love you personally choose to give. That is one thing that makes love so powerful. Love only requires personal choice at the individual level first, it costs nothing to practice, and the more you give it away, the more you get back. We found that when our motive and purpose is to promote and grow in Love, we live in harmony with God and the rest of Creation. Doing this, we have discovered our needs being met, and the means to keep building a better world have been provided without having to dedicate our time to work we do not believe in or to producing things for the sole purpose of making money. For the Gift Economy to work for us, we first had to learn to live on less, instead of focusing on getting more. This has been quite liberating. It starts with a willingness to live on the bare minimum: food and clothing, and it grows into managing all of our resources responsibly. Living in this way can be fairly humbling and it does have its challenges. When you have money in your hand you tend to think, “I can buy what I want, when I want it.” Having little or no money forces you to be more creative, resourceful, and patient. In the consumer societies in which most of us have grown up, we are accustomed to acquiring whatever we want instantly, sometimes going into debt if we don’t immediately have the cash to get it. But when we have to wait for things to come, we discover what it is we really need and what we can live without. One of the discoveries we have made by seeking to live simply has been the abundance of resources already available as discarded “waste” in many developed nations. In fact, most of our food and clothes, and a lot of other needs, have been met through things that we have found thrown out! We have been able to furnish and kit out entire houses and vehicles with a wide variety of items we have found thrown away over the years. Surprisingly, we often experience an overabundance of material goods, including luxury food items discarded by supermarkets. As a bonus, we regularly find enough to share freely with others as well. As a result, we always have enough. Because we don’t want to contribute to the ever-growing pile of unnecessary material goods in the world, we seek first to use what is already freely available. And this has eased much of the pressure that communities normally feel to generate steady incomes to acquire resources. This issue of simplicity has been one of the first key factors in living out a successful Gift Economy model. Sharing is practically synonymous with community. All communities must share their resources (time, energy, money, possessions, etc.) in some way. In our community we share all of our income and resources. No one calls anything their own. This attitude dramatically reduces disagreements related to material things, because we are all in it together. If times are tough, they are tough for all of us, and if things are going well, they go well for everyone. Deep mutual trust is built when we have this level of material equality, and as a result it is rare to have disputes over finances or belongings in our community. One of the reasons we have been successful with this level of sharing has been making clear our requirements for membership. Like the primitive Christians, when someone joins our community, they quit their secular job (if they had one) and sell all their possessions. The proceeds are distributed to the poor, and if necessary, used for various needs within the community itself. This initial and individual leap of faith sets the tone for how we manage our resources as a community. It takes faith to put your life in the hands of an unseen force, but we can testify from personal experience that there is nothing to fear, and that God is faithful and true to His promises. Our brothers and sisters who share the journey with us help us along the way, and there is always enough for everyone. I think most “trouble” comes when people have seen, or start to see, the community as their means of support. Communities fail when their members forget that the community should always be seen as a platform for better practicing Love. It’s about taking personal responsibility and seeking to help others to do the same. Whatever we do should flow from personal conviction and not just because “the group” says so. Being vigilant about weeding out personal and corporate greed in any decision-making is highly important. What is needed for a successful community based on a Gift Economy are people who are willing to work in harmony with each other and who seek to use the resources lovingly provided as an expression of love, rather than trying to devise ways to exploit them for personal gain. Once we do that, we find harmony; life stops being a struggle for survival and becomes an expression of genuine liberty and prosperity. We were created as free beings with personal autonomy; we need to practice that independence of spirit in conjunction with the realization that we have an intrinsic interdependence with the world, with others around us, and with the Creator of it all. Changing our motivation (from “what can I get” to “what can I give”) and then finding (or creating!) a community of like-spirited individuals who share our vision is a helpful expression of this. Sharing, therefore, is another key factor in living out a Gift Economy as a community. The Gift Economy functions on giving and receiving freely, rather than buying and selling, or demanding and taking. Living out a Gift Economy means continually looking for ways to give. We strive to give from ALL our resources available: money, possessions, energy, and time. “Working for Love, Not Money” is the natural conclusion to this type of giving. We give our energy and time to others without demanding anything back for it. This new way of “doing business” is not something any of us came up with on our own. We discovered it in the teachings of Jesus. He said that we cannot work for both God and money at the same time, and that it is impossible to serve one without cheating the other. He said that God feeds the birds and clothes the flowers and will do the same for us if we seek to build God’s kingdom first. These truths are fundamental to our Gift Economy. Working for Love is not unique to our community. It is practiced in different ways by other communities, religious and otherwise, and there are even examples of it in society at large. For example, plenty of people in our society are willing to volunteer time and service to causes that they are interested in, whether it be Amnesty International, a political party, a soup kitchen, or walking their elderly neighbor’s dog. This desire to give is intrinsic to all of us. I think committed communities like ours differ from others in that we have decided to make Love and sharing the basis on which we live our entire lives. For us, working for love is our full-time job—and we see so much genuine need for Love in the world that we are never going to run out of work to do! While we believe in doing everything for Love and without expecting anything in return, we are not entirely removed from the economic system (yet!) and we still use money (see section below on “Accepting Gifts”). We see greed (“the love of money”) as being the root cause of evil in our world. So our emphasis is on not doing anything for the purpose of making money or gaining material wealth. In this way, we seek to combat corruption in ourselves and to, hopefully, give testimony that another way of doing things is possible—here and now. A lot of people tend to view this kind of lifestyle as being unproductive, and only for those who don’t want to work (or who can’t work). Society has been led to believe that unless there is a financial/material exchange then the goods or services have no value. Taking even just one example of a demanding job that isn’t materially rewarded—raising children—we know that such a teaching is false. There are so many jobs that don’t get done—even when people are paid to do them—that we happily do for free simply because we believe they have value in and of themselves. It is a challenge to personal pride knowing that many people do not value the concept of working for love, yet I know for myself that the sense of purpose I have in my life, and the fact that I am living in accord with my conscience, is more than recompense for what others may think of what I am doing. Obviously, part of getting the job done requires confronting the prejudices of society, loved ones, peers, etc. That can be too tall an order for some people, but it is essential if we are to do the work that needs to be done in making real, lasting improvements to the world around us. Virtually any genuinely productive and positive work that is normally done for money can be done even better for love. We can create, build, fix, and improve almost anything for love. In fact, when love is our motivation (rather than money), we can concentrate on the best jobs that have the best chances of producing the best results we want to see in the world. For our community, a lot of our work is, like this article, looking for ways to show and inspire others with how this Gift Economy works. We produce and distribute literature, music, and videos which do just that. We also get involved in a wide range of different projects aimed at reinforcing the concept of working for love and not money. We experiment with offering free work to people, making a point of not accepting payment for the work that we do. We have spent time in developing countries helping local populations with the issues that were important to them. 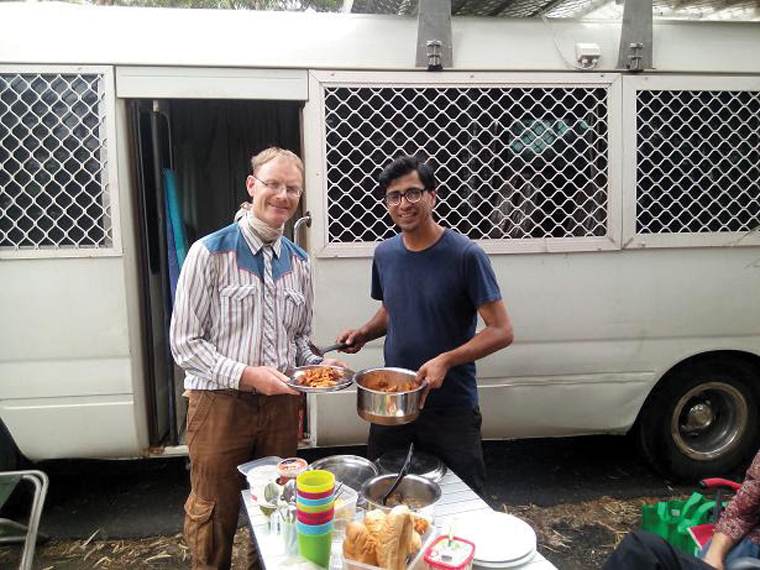 We have been involved in initiatives started by others such as Buy Nothing Day, promoting freeganism, holding free markets—and everything in between, from campaigning for refugee rights to staging money-burning demonstrations, donating kidneys to strangers, and walking 2000km across the Nullarbor desert in Australia without taking any food or a change of clothes. All of these have helped to emphasise that this Gift Economy works here and now in the real world. Working for love demonstrates that the traditional economic model is not necessary when our focus is on helping others, and it is fundamental to the Gift Economy. A practical way of encouraging a Gift Economy is to work on a “no-conditions donation basis.” Many people already use this model online, where they offer their music, books, and other digital content in exchange for a donation of any amount or for free, left at the discretion of the person wanting the product or service. We have simply extended this concept into the tangible world by offering our physical goods and services on a donation basis. Because we are working for love, we are willing to give our products, time, and energy for free. If we receive nothing in exchange for what we give we are happy to have given for free, and if we happen to receive a donation, it’s a bonus! So, in effect, there is no way that we can actually lose out on the deal! We accept donations for the books and DVDs that we produce, and because people value the material, we usually receive enough to cover the cost of printing and more. For people who want to purchase our material in bulk, we usually ask them to simply cover the cost of printing or production. This means that our goods and services are very accessible and so it has made it easier for people to share more of our materials with others. Having said that, we are seeking to move more and more towards developing total independence from cash. We especially value gifts already purchased or that incorporate useful recycled unwanted goods, because these usually represent more time, effort, and care on behalf of the giver. Accepting gifts is an important ingredient to living out a Gift Economy, but we cannot rely on such gifts. If we do, we can easily be tempted to start worrying about what kind of gifts we receive as a result of our giving, which will hamper our efforts in working purely for love. Ultimately, our faith needs to be in something bigger than ourselves and our strategies for acquiring resources. We recognize that a Gift Economy works because, ultimately, that is how God operates. We have freely received from God and so we can freely give. And it is this element of faith that has made the Gift Economy sustainable for us as a community, because we do not always receive as a direct result of our giving. We trust that provision will come when we need it and from ANY source that God chooses to use. Our community has occasionally experienced what we would regard as “miraculous” provisions. For example, we have had many experiences of having a specific need met about the same time that the need arises, without the giver knowing about the need. We have done numerous experiments of living without money and seen that we have never lacked what we needed. This invariably gives us renewed faith that God is aware of our situation, and that he won’t let us down when HE thinks we really need something. Most of our needs are not met immediately, and sometimes, when we think we need something, there is more to be gained by learning to live without it. But God has also provided for us much more abundantly than we have asked, not just materially but also in rich spiritual experiences that we would not exchange for any amount of money! We are conscious that not all communities share our Christian convictions. But we encourage all communities that wish to explore a Gift Economy to have faith in Love. Believe that Love is the highest power that exists in the universe, and believe that if our lives are dedicated to serving Love faithfully, then all our needs (material, emotional, and spiritual) will be met. We believe that motives play a fundamental role in the kind of society or community that we are presently a part of, and the one that we want to be a part of in the future. If the motives are skewed, the results are going to be skewed. Personal commitment to values that go beyond a materialistic vision of life is essential. We believe that being willing to go without so that others will have enough, sharing what we have with others, trusting that our lives have value, and that God/Love is the means AND the end, are revolutionary ideas that have the power to transform the world in which we live, should we put them into practice. Many people sense deep down that the way the system is currently structured is not what life is or should be about. Something instinctively tells us all that there must be an alternative. Hearing about the Gift Economy has inspired many to make significant changes in their lives. They don’t always choose the same lifestyle as we do, but we have been able to make connections with people who are trying to make sharing and selflessness a bigger priority in their lives, and who are taking steps to disengage from materialism. All of that represents success in our eyes. As the rest of the world continues at full speed towards a more materialistic and digital model, we continue seeking ways to deepen our understanding and practice of the Gift Economy. Many countries are seeking a “cashless society” where all monetary transactions are digitally recorded and greater restrictions on commerce are put in place. But we are choosing to move towards practicing a “moneyless” model where we don’t interact with the monetary system in any way, digital or otherwise. This is, for us, the natural progression to this concept of working for God/Love. However, we are not the forerunners in this area! A few trailblazers out there have already been living without money for many years! These include Suelo in the US, Mark Boyle in the UK, and Peace Pilgrim, who walked for peace in the US for over 20 years before her death. These are a few examples of a wider movement of people who are moving towards a different economic model than that presented by our current world system. The great thing about this model is that, in agreement with what Jesus said, this works even with as few as two or three people, so it can get started almost anywhere and any place, and without any infrastructure or set-up costs. Putting love into practice can be done even when you have nothing materially. It just requires faith to believe it and, most importantly, to act on it. This article was a collaboration by a few brothers and sisters (including Tina Dunn, primary author) in the Jesus Christian community, who have been living the principles of a gift economy for a few decades. 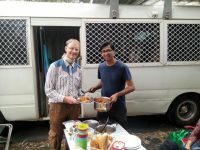 They can usually be found distributing books and DVDs on the streets of Australia, rain, hail, or shine, or cooking a fabulous feast of freshly-found food in their mobile home. They can be contacted at fold [at] idl.net.au. Best to search our online directory and possibly post a free classified ad.